The last two months have certainly been months to remember for my new hubby and I. For the past three years, we have been going back and forth about where we should live, what we should do with our lives, and who we wanted to be when we grew up. After getting engaged in July, the reality set in that we really needed to do something or live an hour apart FOREVER. The biggest hangup is that we both love our jobs and our families and the places where we grew up. The best solution was for both of us to make a move, give up a little bit of home, and make a new home together. Simple enough, right? So, we decided that our triangle of acceptable places to live was somewhere between Dodge, Wisner, or West Point, Nebraska. We started our home search online through local agents in those communities, but couldn't find anything that we thought would work. Then, we resorted to the for-sale-by-owner route. Low and behold, we looked at a house in Wisner and decided that it would work for us! The price was right, the space was good, and we could make it our own! Hurray! The search was over! Soon, we were on our way to a November 30th closing date. That was our train of thinking at the beginning of November. Fast forward to November 21st when the dreaded call came, just days before Thanksgiving and our big announcement to the family that we were closing on a home soon. The owner of the home we had painstakingly searched for called to inform us that the kitchen faucet had sprung a leak and water had saturated the main floor and basement living area as the home sat vacant. Our momentum literally came to a screeching halt and we could hear the wind getting knocked out of our sails. Closing was off for the 30th, and so began process of insurance, adjusters and mitigation/remediation. (Not to mention we were getting married in just under a month.) On the bright side, we were getting new flooring and a new ceiling in the basement, and things didn't seem quite as bad then. So, in between wedding plans, we waited...and waited...and waited....to hear if the house was salvageable for a closing in the near future. We searched for carpeting...and paint...and ceiling tiles....and countertops...and kitchens...and contractors...and estimates...and did I mention we were quickly approaching the big day?? Finally, the day before the wedding, we received word that the house was "dry" and we would be closing on December 30th. Without much time to think things through, we agreed that was a plan, scribbled some signatures on an addendum and got hitched. Life was good! This week has been a flurry of phone calls to the insurance agency about settlement amounts, estimates for repair work (which we didn't know were suddenly our responsibility to provide), and trips to and fro trying to coordinate everything. And we don't even own the house! The sellers are pushing us to close on Friday without anything but a handshake and prayer that the insurance will pay out for the necessary repairs. But, guess what, those checks aren't coming to us as the buyers, they are going to the sellers. We get the bills, they get the money...sounds like a normal day. 1) Close on the house with the handshake and a prayer mentality that the insurance will come through. 2) Reduce the price we pay for the house to reflect the damages and close as planned. 3) Pay the price we agreed for the house and have the attorney handling the closing hold some of the money in escrow until the work is complete and the final insurance settlement is issued to protect us and the sellers from unforeseen issues with the insurance and the repair work. And this is where things stand 2 days before closing. No resolution, but some viable possibilities are on the horizon. 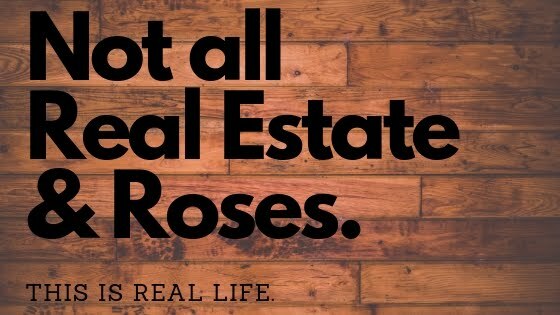 The reason I am sharing this with all of you is because it has truly opened my eyes to the many stresses that go with buying or selling a home. It has certainly served as a reminder that a road paved with good intentions may still have several bumps in it. This is a lesson to me that is already making me a better agent, and it will allow me to provide my customers and clients with the service they should expect. In other words, I can relate to what you are going through. The emotions, the paperwork, the glitches, the compromises...we've seen it all in the last six weeks. We are unsure what tomorrow holds for our first home buying adventure as husband and wife. We know that whatever happens was meant to be, and we look forward to keeping you informed of our progress. If anything, it will make a great story to tell our children when they ask us about our first home. The source of all of our problems!